Not much is known about the obstacle course that Al Qaeda requires of all of their terrorists before graduating. 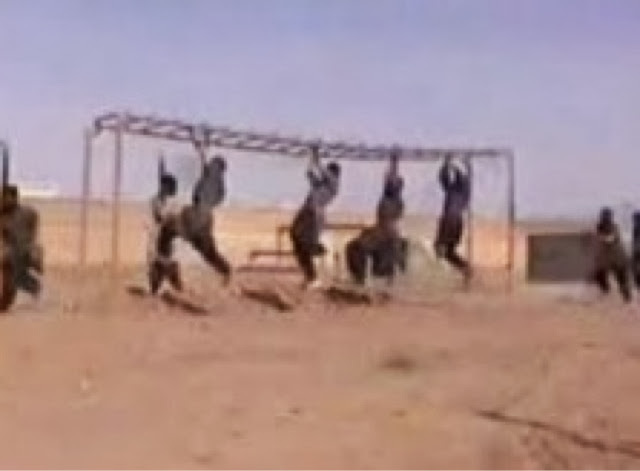 There have been murmers of discontent amongst many rank-and-file terrorists that the western news media have been using the same 20-second video clip featuring terrorists training on monkey bars. "This is an investment for the future of Al Qaeda--- stronger terrorists with more upper-body agility", the press release concluded. The new monkey bars are planned to have a moat of alligators beneath to quickly weed-out any scronny terrorists in training. As of press time, a United States Navy drone is headed in the direction of the Bin Laden Memorial Training center to bomb that dump into oblivion.